All babies are already in their new loving homes. Hor-khang lives by our friends Jemelkovi in Olomouc - kennel Sengge. H'Aran stays in our family. Pictures of puppies in 3 - 4 months, in 8 - 9 months. Chandu is a young strong male with wonderful movement and excellent coat. 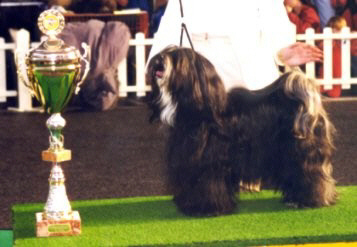 He has won the open class in the World Dog Show Milano 2000. 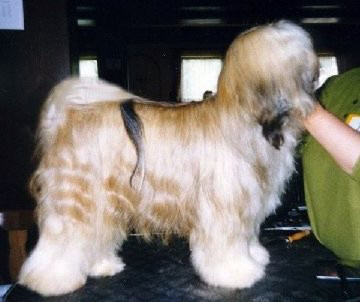 Chandu is bred by Minna Lemos, Switzerland, and is owned by Anke Peine, Germany (kennel "von Nama-schu"). His sire is ICH, DCH, SCH Thu-Sangs Amhir Aladin (Thu-Sangs Black Lucky Luke x CH Thu-Sangs Creme Christel). His dam is CHCH Ski-La-Kyi Paani (ICH, USACH, DCH Sheydon's Sam Dup x ICH, DCH Karamain Colette). Chandu is eyechecked (free of PRA, PLL, cataract), HD-B (free of dysplasia).